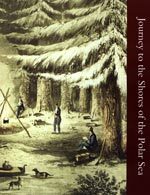 This is John Franklin’s narrative of his near fatal expedition in the years 1819 to 1822, to explore by land, the Northern Coast of North America (Canada). Covering more than 5,000 miles, during which many of his men died, he describes in fascinating detail the trials and tribulations encountered by them. In particular his friendship and empathy with the Indians that they met and befriended in their travels up to the Arctic paid dividends when their strength and resources waned. The book contains many plates illustrating their journey and encounters; together with substantial contributions from colleagues covering the natural history of the region and the Aurora Borealis. Ironically, Franklin survived this dangerous trip only to disappear with two ships and companies of men on an Arctic voyage in search of the legendary North West Passage over twenty years later. Captain John Franklin, R.N., F.R.S.